Ofgem has proposed a significant code review (SCR) to examine forward-looking network charges and grid access arrangements. The regulator says changes are needed to facilitate the mass adoption of low-carbon technologies such as electric vehicles, distributed generation and heat pumps. If the review goes ahead, the regulator expects to launch it by the end of 2018 and conclude the process by early 2020. It aims for any resulting code modifications to be implemented by April 2022 and take effect by April 2023. Ofgem first outlined plans to reform grid access arrangements and forward-looking network charges in a working paper published in November 2017. Since then, the regulator has chaired two taskforces – one looking at each of the issues – which developed detailed options and undertook an initial assessment of them. The taskforces published a final report containing their conclusions and recommendations in May. It is now consulting on whether to hold an SCR to decide on which reforms, if any, to take forward. Ofgem is considering three different options for its scope – a narrow approach, a moderate approach and a comprehensive approach. Under the narrow approach, the review would examine the definition and choice of access rights for smaller users; forward-looking distribution use of system (DUoS) and transmission network use of system (TNUoS) charges; and the distribution connection charging boundary. Under the moderate approach it would also explore the definition and choice of access rights for larger users. Under the comprehensive approach, it would look at all the above plus the allocation of network access rights. Network capacity should be allocated in accordance with users’ needs. Network users should face cost-reflective charges for access and usage. Network arrangements should provide a level playing field between different types of users and technologies. Forward-looking charges should be sufficiently simple, transparent and predictable to enable users to make decisions based on them. Risks should be appropriately apportioned when developing and allocating network capacity. Network arrangements should provide high-quality information about where and when new network capacity is needed. Network arrangements should take into account the needs of vulnerable customers. The regulator’s proposals were partly informed by a report it commissioned from the consultancy Baringa. 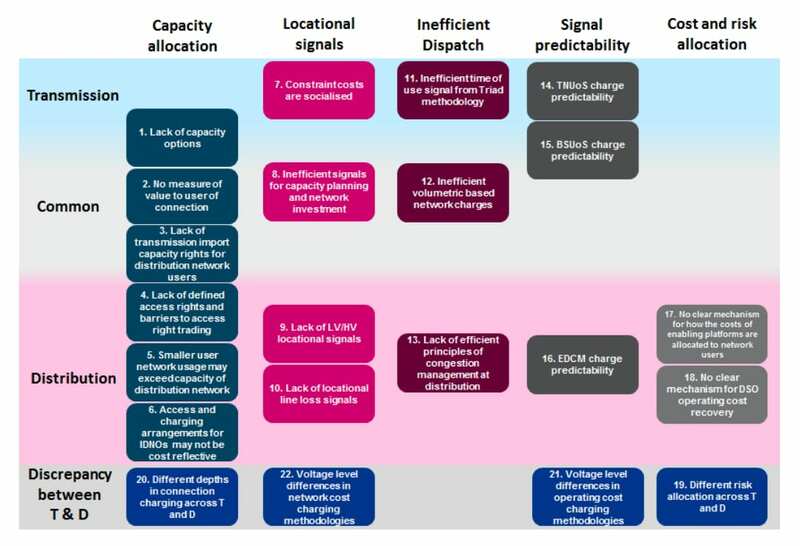 The report identified 22 potential issues with the current network arrangements, covering five areas: capacity allocation; locational price signals; inefficient dispatch; price signal predictability; and cost and risk allocation. Ofgem is already conducting a related SCR looking at residual network charges. Forward-looking are designed to reflect users’ impacts on costs due to investments in new capacity, whilst residual charges are designed to recover the sunk costs of the existing network. The review was launched shortly after Ofgem decided to proceed with cuts to the residual element of the triad avoidance payments available to small-scale distributed generators.